Hypervelocity stars: what are they running from? Hypervelocity stars (HVSs) are a group of very special objects. They are stars, found in the halo of our galaxy, whose velocities are high enough that they must be unbound from the Milky Way (that is, their velocity is higher than the escape velocity at their location). The interesting question with regard to these stars is how they came to have such high speeds. In 1988, J. G. Hills theorized that a three-body interaction with a massive object, such as the 4 million solar mass black hole (Sgr A*) at the center of our galaxy, could be responsible for ejecting stars with extremely large velocities. In today’s paper, the authors describe the continuation of their survey for these strange objects, in hopes that they can better constrain the origin of the population, and perhaps even shed some light on properties of the Galactic center that are not well understood. This figure shows the selection box (cyan) for spectroscopic targets. The hypervelocity stars found in the followup are colored in magenta. Shown in dark blue are the theoretical colors for B stars of several different masses, showing the color evolution with mass. The underlying population of stars (black points) is from the SDSS. To get stellar velocities, it is necessary to take spectra of stars, and spectroscopy is a time-consuming and expensive observation to make. Thus, in order to select the highest velocity stars in our galaxy, the authors need a fairly efficient method of target selection. They achieve this by targeting 2.5 – 4 solar mass stars, which are bright enough to be seen to large distances, and of a spectral type (they are all B stars) that matches the population of bright stars near the Galactic center. The authors select these stars by doing a color color cut of Sloan Digital Sky Survey (SDSS) data, shown in the figure at right. Because of the faint magnitudes being surveyed, these stars are likely to be in the Galactic halo, and the selection box chooses objects that are bluer than blue horizontal branch stars, and redder than foreground white dwarfs. 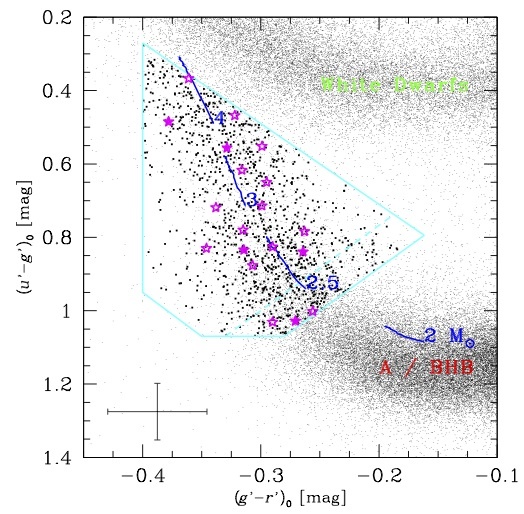 The B stars that the authors are targeting have relatively short lifetimes (several hundred million years), and since there is no ongoing star formation in the halo, these stars shouldn’t be there unless they were ejected. In this paper, the authors present the results from spectroscopy of 497 new candidates, as well as their 609 previously published candidates. They calculate the velocities of these stars using the radial velocity method, making a correction for the rest frame velocity at each star’s position in the Galaxy. 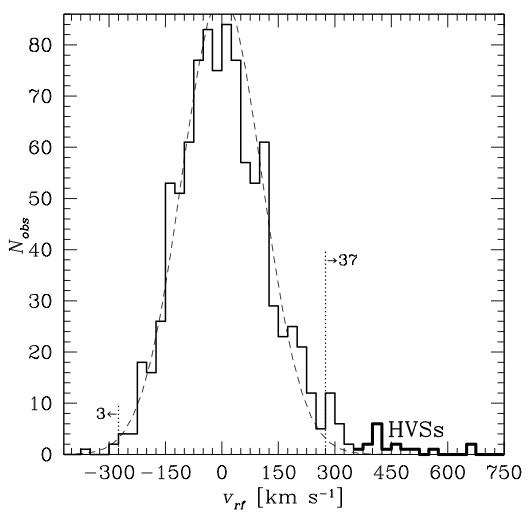 A histogram of the resulting velocities is shown in the figure below, including the 16 detected hypervelocity stars, shown in bold. The authors point out that these velocities are actually lower limits, because only the line-of-sight component of velocity can be measured. A histogram of all of the measured rest-frame stellar velocities in the survey. The bold line above 400 km/s indicates the region of hypervelocity stars. There are several interesting points to note about this histogram. Any stars that have velocities greater than 400 km/s are considered hypervelocity stars, and they are assumed to be unbound from the Milky Way. The fact that no stars are seen with velocities of negative 400 km/s or less (a negative velocity means the star is coming towards us) is consistent with the ejection picture. The slight pileup of stars with velocities of around 300 km/s is thought to be a population that was probably ejected from the galactic center but with velocities low enough to remain bound. The fact that there are not an equal number of negative 300 km/s stars indicates that the stellar lifetimes are shorter than the billion year turnaround time for a star with this speed, again consistent with the fact that these are B stars. The authors consider several possible origins for these stars besides an interaction with Sgr A*, such as three-body stellar interactions and tidal disruption events. (See this astrobite for a discussion of galactic tidal disruption.) 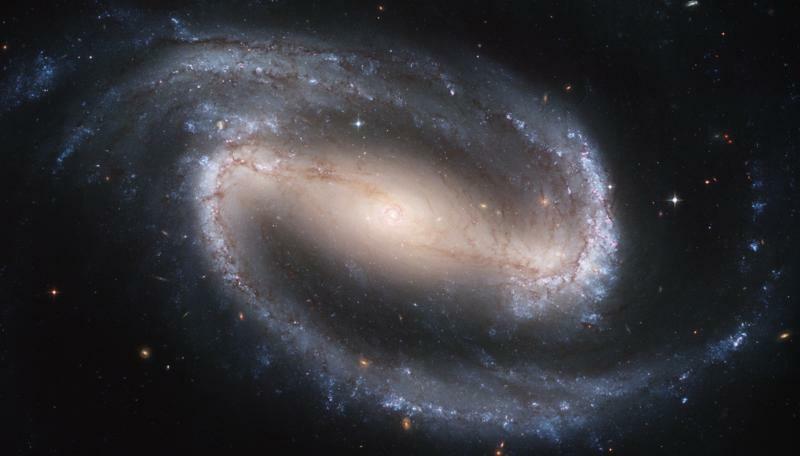 They find that the velocities are too high to be produced by just stellar interactions, and the range in time of ejection (calculated by how far out the stars have traveled), means they were unlikely to be the result of an interaction with a satellite galaxy. Lastly, the authors discuss an anisotropy in the location of the stars – they are not distributed isotropically across the sky. This cannot be explained by just the interaction with Sgr A*, which would theoretically scatter stars randomly in all directions. The authors suggest that perhaps an asymmetric potential at the Galactic center is responsible, but without better statistics, constraints are hard to place. Exactly correct; an asymmetry is the cause. The high pressure/mag that exists is almost never symmetrical such as formed the Hoag object, and these hypervelocity stars are the result. They have stumbled into the energy aligned for ejection. Good Work! !